What I do need however, is a new handbag. I'm not a great one for changing out handbags unless there's a real clash with what I'm wearing, or I'm going to a wedding. Can't really take a bulky, functional black thing when you've thought long and hard about all other aspects of your outfit can you? Actually, I'm also not a great one for thinking long and hard about what I wear, so never mind. My present handbag looked ideal when I bought it. It has a main section with a slightly smaller section on either side. "Ah" I thought "I can be one of those people who always knows where everything is in her bag. No more diving to the very bottom of the abyss." The plan was to have money things in the middle, with lipstick-y things in one side section and keys and house items etc. in the other. 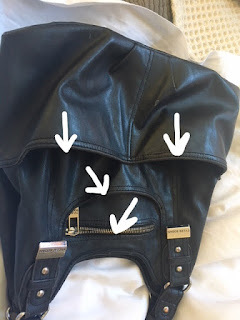 Unfortunately, each sections comes with a myriad of pockets and sub-sections and that's where the trouble starts. My phone is usually kept on the outside, zipped pocket of one of the side sections. 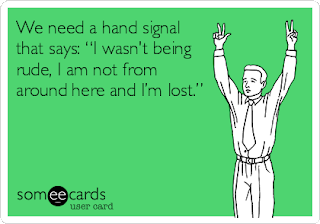 That usually works well except when I'm at things like airports, and the phone then just gets dropped into the middle with everything else. Cue panicked cries of "I think I've left my phone at Security", while my family sigh and wait for me to search each and every compartment (except the middle one), until I find it. The other side on the outside contains no less than four separate pockets! I don't even carry enough stuff around to make use of them. What was I thinking? Currently I have my "readers" in one pocket and a house key in the zipped part. (See, I didn't even stick to the original plan of keeping house things in the inner compartment.) Other than that, it's usually anyone's guess as to what one might find in the other sections. Is it any wonder I can never find anything? So, I'm looking for a bag that has a few compartments, but not the ludicrous amount that this one has. I don't want a bag that is basically a posh sack. Been there, done with having to tip everything out to find a tissue. I could get one of those portable organiser things that you just pick up and move from bag to bag, but doesn't that require the same size bags to drop it into? Advice needed. Ball & Chain is actually threatening to burn my bag and thus force me into a new purchase. 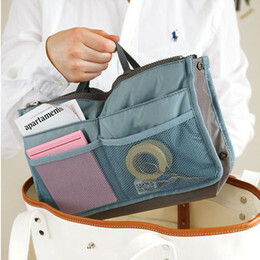 Oh, I am of no help because I refuse to buy bags with compartments...don't ask me why, I don't know. But I am ULTRA picky about bags and that means I've been carrying a bag I despise for well over a year (the opening is too small and the handles are too short), because I can't find one I like. It does, doesn't it? You "try" it on in the store, make sure your stuff will fit but until you get it home and start using it, you don't quite notice the drawbacks...at least that's been my experience of late. I don't try too hard to match my bag to my outfits except for special occasions. Years ago, I found out about Healthy Back Bags. Though they lack something in the style category, and I still have to do deep dives for various items, I have not had shoulder or neck problems from carrying too heavy a bag since I started using the HBB. For the rest, I use Miche bags, with interchangeable shells. I cannot be bothered to move stuff around from bag to bag. Go shopping in the sales. You will know your next bag when you find it.